Home » Blog » New Lighting Technology keeps interiors cozy and saves money! New Lighting Technology keeps interiors cozy and saves money! 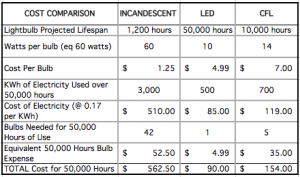 CHANGE YOUR LIGHT BULBS – REDUCE ELECTRICITY COSTS BY 75%! The newest technology for LIGHTING our homes is LED. Light Emitting Diodes use 80% less energy than a standard incandescent light bulb. Not only that, you can count on an LED bulb to give you an average of 50,000 hours of service before a replacement is necessary. This compares to 1,200 hours for a 60 watt incandescent bulb! An LED bulb not only uses a fraction of the energy, it lasts 42 times longer than an incandescent bulb! The best news is that LED bulbs fit into the same fixtures you have now. Many of us purchased Compact Fluorescent bulbs as an alternative to incandescent, only to be disappointed in the color of light they emitted. Nothing looked the same: colors were different and the light was dim. They just weren’t as good as what we were used to! The feature that makes LEDs so revolutionary is the light color temperature, or the warmth of the light they generate. The warmer the color, the more natural the lighting appears to the naked eye. An LED has several ‘light temperatures’ that range from Soft White to Bright White to Natural Light. That is exactly what makes them the economical and practical ‘light bulb’ of the future. LEDs are available in a variety of Watts that compare to the incandescent light bulbs or CFL’s that you have been using. A 10 Watt LED bulb emits as much light as a 75 watt incandescent bulb. See my chart below for comparable wattages. Use table to select light bulbs of comparable brightness. Note: Traditional dimmer switches are not compatible with LED lightbulbs. I suggest that you replace older dimmer switches with new, LED compatible rheostats. Get our latest posts straight to your inbox. Dreaming of the Ideal Bedroom? We can help. Nancy Sibrava Launches New Website! A professional Interior Design firm with over 30 years of experience. Copyright © 2016-2019 Sibrava & Associates. All Rights Reserved.